We’d love your help. Let us know what’s wrong with this preview of Aetheric Mechanics by Warren Ellis. The year is 1907, and Britain has entered into a terrifying war with Ruritania, whose strange metal planes darken the skies, and whose monstrous war engines cast looming shadows from across the channel. Doctor Robert Watcham, lately returned to London from the front, makes his homecoming to Dilke Street. There lives his old friend and England's greatest amateur detective, Sax Raker. Even as his beloved city prepares for war, Raker is himself about to embark on the strangest (and, perhaps, the most important) investigation of his career: the case of the man who wasn't there. Is the mysterious, vanishing killer, at last, evidence for Raker's long-held belief in a secret criminal mastermind? Is it some apparition uniquely belonging to this city, a place that seems to have lost all semblance of sense two years ago? Or do all the signs point to something much, much worse? 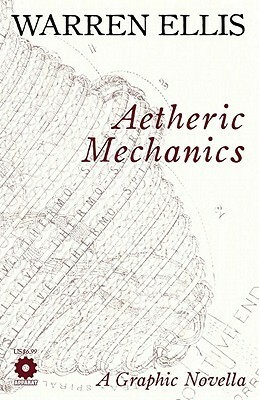 To ask other readers questions about Aetheric Mechanics, please sign up. Trust Warren Ellis to combine a murder mystery, steampunk, war stories, Sherlock Holmes, giant robots, quantum mechanics, and flying cars in just 40 pages. And make it good. So. The story is chugging along, doing nothing special, but the art is great right? So I keep on reading. How does it end? It ends like this: *magic happens* and that is unacceptable. Too clumsy. Too assured that its cleverness will save it. This review has been hidden because it contains spoilers. To view it, click here. An impressive tale! Combining time travel, a complex whodunit and Sherlock Holmes (so named Sad Rakker) is one helluva amazing story. Started off slow, but builds quickly and the ending will mindfuck you for sure. It's the last thing I expected Sax Rakker to have done. But I guess that's what anyone else would've done once confronted with the ugly truth of the unreality of your existence. No one likes to be fodder for an experiment gone wrong. Ülilühike (40+ lk.) must-valge aurupunk, on ka elemente "Ruritaania romansist" ning peategelane "eradetektiiv Sax Raker", ja tema ustav arstist abiline "doktor Watcham" meenutavad muidugi teadagi keda, Baker Streedilt. Ainult et ilmelikult lühike oli,ja mõnevõrra segase lõpplahendusega. Mulle jäi rohkem mulje miskist keel-põses naljast kui korralikust aurupungist. Ja no must-valge mulle eriti ei istu ka, pole kunagi istunud. Keskmine "kolm". Very good. If not my favorite, Ellis is on my top 3 list of favorite comic book writers. Great little story & artwork, my only complaint is that's it's really short. Although the page count is pretty low almost every panel has a lot of good dialog, so in truth, it's probably got as much content as comic that's at least 50% bigger, so it was definitely worth the $6.99 I paid for it. This was surprisingly fun! Truly amazing art by Pagliarani. Holmes with a twist. A futuristic, beautiful, steampunk ish twist. It’s not very often that I get to review a graphic novel, so when a friend let me borrow this, I was really excited to tell you all about it. Aetheric Mechanics takes place in an alternate Earth in which Britain is at war with a place called Ruritania, whose powerful technology is quickly turning the tide of the war in their favor. Doctor Richard Watcham returns from the war front and, upon reuniting with Sax Raker, an old friend and renowned amateur detective, he embarks on an investigation of b It’s not very often that I get to review a graphic novel, so when a friend let me borrow this, I was really excited to tell you all about it. Aetheric Mechanics takes place in an alternate Earth in which Britain is at war with a place called Ruritania, whose powerful technology is quickly turning the tide of the war in their favor. Doctor Richard Watcham returns from the war front and, upon reuniting with Sax Raker, an old friend and renowned amateur detective, he embarks on an investigation of bizarre origins. I’m not familiar with Warren Ellis’ work, but if Aetheric Mechanics is any indication of his talent in coming up with weird stories, then I suspect I’ll enjoy just about anything he writes. There’s a lot going on here, and the brief instances that explain the current situation (the war with Ruritania, etc.) add some depth to the world Mr. Ellis is working with. Aetheric Mechanics is also generally visually gorgeous, with an exceptional amount of detail throughout the piece. Add to that a strange, steampunk-ish murder mystery and there’s plenty here to keep you entertained. The dialogue is particularly strong here, unlike a lot of comics/graphic novels that try to write in a pseudo-Victorian/WW2-analogous era (assuming, of course, that I got the representative periods correct). Raker, for instance, has a distinct voice that will remind some, for reasons that become obvious when you read the story, of other detective types we've come to know. The other characters, while not as distinct as far as attention grabbing is concerned, hold their own in a world that will immediately spark some of the "gosh wow" desperately needed in quasi-SF tales. The only problems I had with Aetheric Mechanics are probably normal things found within the comic/graphic novel industry. The story was, in my opinion, rushed, and I would have liked to see the story expanded over two or three volumes to give the twist ending greater impact. The result was that the relationships between characters were either left to reader assumption or not developed at all. Also, the lack of color and the pencil/ink combination removed some of the depth that needed to be there in certain panels (particularly the action-packed ones). Neither of these complaints ruined the experience for me, though. I picked this up because I’m a Warren Ellis junkie, and will read anything with his name on it. I’m particularly fond of his APPARAT publishing project, in which he writes comics that might have been if not for the comics code and the superhero takeover. Sort of. Anyhow, Aetheric Mechanics is a steampunk alternate history London in which quantum mechanics are available to turn-of-the-century technologists, such that Britain has ships in space. It follows the story of a doctor returning home from I picked this up because I’m a Warren Ellis junkie, and will read anything with his name on it. I’m particularly fond of his APPARAT publishing project, in which he writes comics that might have been if not for the comics code and the superhero takeover. Sort of. * The art in the comic is good, of course, with the Holmes doppleganger looking a lot like Jeremy Brett. At the same time, I prefer less dense images when the artist doing the inking doesn’t use much shading and the images are in black and white. Like Juan Jose Ryp’s stuff, I’m not as keen on the very dense images the larger panels in this comic use. That said, the cool Victorian space-age dreadnoughts and towering robots are awesome. * Ellis does a nice job of revealing the Holmes aspect of the story. It occurred to me — oh man, doctor coming back from the war, returning to his “eccentric” roommate — just about the time that it’s actually confirmed for us. * The resolution is satisfying, but not as amazing as some of Ellis’ other work has been. I guess it’s pretty hard to do that with a novella. An above-average Warren Ellis story with great black and white art. I was drawn in by the steampunk Sherlock Holmesy-ness, but was impressed and surprised by a way-out there conclusion that explains a lot more than you think it will but still leaves you dying to know what will happen to these characters next. Very short too. This felt more like a long teaser than a finished product. The art is really nice, and the ending is interesting but comes about way too suddenly. The artwork is lovely, the story is solid - with the idea of a world of mashed together fictional concepts from the Victorian period explained in a new and different way - and worth the read. It's not Ellis' deepest work, but it is a fun book. This was an incredible take on steampunk Sherlock Holmes. My one complaint is that I hate reading a story that is so deft and detailed in its worldbuilding (even if that world is effectively a fanfiction rendition of another world) but in the end is more of a prologue than a complete tale. A different London than history remembers. A fun little puzzle-box with an unexpected heart. A teensy bit too slight, but just fine when calculating all the subtext. Gorgeous, liquid, highly-detailed art of an alternate yet terrifyingly familiar world. The choice of ending was... interesting. This review has been hidden because it contains spoilers. To view it, click here. I have no idea how I found this book. I was looking through lists of books I had saved in my library catalog and found it there, but I don't recall when I found it, or what attracted me to it at the time. I almost didn't want to read it because I've found Warren Ellis's works to be a bit irritating, but this wasn't a bad read. My initial impression was that it was a good Sherlock Holmes sort of story (I've read a few in the past), hitting the right notes of camaraderie between main characters an I have no idea how I found this book. I was looking through lists of books I had saved in my library catalog and found it there, but I don't recall when I found it, or what attracted me to it at the time. I almost didn't want to read it because I've found Warren Ellis's works to be a bit irritating, but this wasn't a bad read. My initial impression was that it was a good Sherlock Holmes sort of story (I've read a few in the past), hitting the right notes of camaraderie between main characters and the absurd levels of observation and deduction displayed by the detective. Of course, it isn't Sherlock Holmes and so part of my initial reaction was wondering why if they were going to copy so many of the details they felt the need to change the names anyway. Of course the solution of the case provides the explanation, in a way. I found it a bit annoying. The science of course is bad, since yet again we see quantum mechanics being used to justify fantasy, but it also stupidly assumes that thoughts and ideas and concepts are equal to "information" as used in quantum theory. But even setting that aside, the resulting world lacks internal coherence, which is rather annoying. How can Britain have space ships (in the steampunky literal ship that flies into space variety) and concerns about holding territory around Mars, and yet be in imminent danger of being invaded? If the threat of loss is that great, either their fleet should have been destroyed, or entirely recalled to provide defense. Of course the true culprit is plot, which wants to introduce us to ideas slowly to start, but then ratchets up the tension for ultimate drama in the end in under 50 pages. Aetheric Mechanics fits in that broad category of Sherlock Holmes fan-fiction that adds sci-fi/fantasy elements (steampunky in this case). It was well-done, with interesting depth to the Holmes and Watson characters, and an unexpected twist in the character of Holmes. That said, the whole climax of the story relied on some dubious science, and was too neatly resolved. (view spoiler)[I would rather lose some of the mystery storyline in order to see Holmes deal with the implications and morality o Aetheric Mechanics fits in that broad category of Sherlock Holmes fan-fiction that adds sci-fi/fantasy elements (steampunky in this case). It was well-done, with interesting depth to the Holmes and Watson characters, and an unexpected twist in the character of Holmes. Isn't that beautiful!? It's wonderfully detailed, and the black and white line work helps make the fantasy elements seem appropriate and commonplace. It reminds me of the suspiciously ordinary-looking art from Cloudy With a Chance of Meatballs. There were a few artistic choices throughout that I thought weren't handled well, but for the most part, it was a joy to look at. As coisas estão um pouco confusas na Londres de final do século XIX. O poderoso império britânico está a perder uma sangrenta guerra contra a Ruritânia, e Londres desaba sob o peso das bombas trazidas pelas impunes aeronaves. A marinha espacial britânica é impotente face às violentas máquinas de guerra da Ruritânia. Ao lado de tudo isto, o meticuloso detective Sax Raker, acompanhado do seu fiel amigo, o médico militar Watcham, e da sua némesis e paixão, Innana Meyer, investiga o estranho caso de As coisas estão um pouco confusas na Londres de final do século XIX. O poderoso império britânico está a perder uma sangrenta guerra contra a Ruritânia, e Londres desaba sob o peso das bombas trazidas pelas impunes aeronaves. A marinha espacial britânica é impotente face às violentas máquinas de guerra da Ruritânia. Ao lado de tudo isto, o meticuloso detective Sax Raker, acompanhado do seu fiel amigo, o médico militar Watcham, e da sua némesis e paixão, Innana Meyer, investiga o estranho caso de um homem que cintilia. Esse homem misterioso acaba por se revelar um mensageiro do futuro, que tenta destruir um passado fictício tornado real por um acidente no decorrer de uma experiência do Large Hadron Collider. É este o mundo da mecânica etérica, onde os cientistas vitorianos parecem conhecer os segredos do espaço, do tempo e da anti-gravidade. Aetheric Mechanics é um fantástico pastiche de conceitos, personagens e ideias da ficção. Ellis brinca com mestria com conceitos que vão do Steampunk às tragédias previstas pelo funcionar do LHC, distorcendo personagens clássicas da literatura inglesa do século XIX. É por isso que Sherlock Holmes acaba com o apelido de Sax, de Sax Roehmer, escritor de romances de aventura e autor do Prisioneiro de Zenda, obra onde o país ficcional Ruritânia é descrita. Um pouco na linha da Liga dos Cavalheiros Extraordinários de Alan Moore e do livro The Difference Engine de Bruce Sterling e William Gibson, mas com o sentido visceral que Ellis confere à sua prosa. This review has been hidden because it contains spoilers. To view it, click here. Re-read. Aetheric Mechanics is a short black and white comic (called a graphic novella) with nicely detailed art and I'd consider it to be a modern day steam-punk Sherlock Holmes concept used with derivatives of Sir Arthur Conan Doyle's original cast. The thrust of the plot was one I found where a derivative of, say, Dr. Who shows up needing to fix the universe, but the twist at the end has Holmes killing off the "Doctor" so that the literary Doyle characters can cont Re-read. Ellis has a go at classic steampunk. It feels a bit too crammed, but I think the problem with this work lies in its length, not in the content. Besides, if Ellis leaves something unresolved, I should presume it was done on purpose. The morale being, this is good steampunk & great fun. Excellent drawings (although my partiality lies elsewhere, I must admit) by Gianluca Pagliarani, whom I should call a compatriot if I believed in countries, fatherlands &c.
i liked this quite a bit, and wish there had been more of it. it's a story within a story within a story, where literary characters have permeated an era and spun off into an alternate reality based on quantum physics. the dialogue's pretty sprightly, and the sense of everything being slightly... off, holds up throughout. i liked the drawings too, a neat way of entangling the altVictorian world with this one. It feels a bit too crammed, but I think the problem with this work lies in its length, not in the content. Besides, if Ellis leaves something unresolved, I assume it was done on purpose. This started off slowly but Ellis did a great job of building a believable yet startling world. It took turns I didn't expect, and morphed from a trifle into something that opens your mind to some interesting possibilities. The art is by Gianluca Pagliarani, which sounds like something Ellis made up, but he's on Facebook so I suppose he's real. In the more "mechanical" moments in the story, the art remind me of Geoff Darrow, which is high praise. An interesting take on the steampunk genre and quantum mechanics. It is a science fiction story cleverly disguised as a mystery novel full of plot twists and a clever detective, as well as spaceships, a cold and logical Ruritanian menace, airplanes, and giant fighting robots. You'll never see the ending coming, and neither does the detective. An exercise in existentialism and the nature of reality itself. 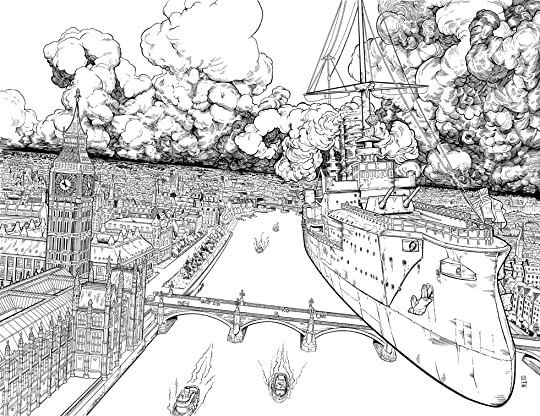 The art is lovely - black and white line drawings with few blocks of black ink - it looks like a complicated colouring-in book, actually - and the steampunky Edwardian age plus airships is great fun. The story lets the art down. The characters are shamelessly Sherlockian - Doyle's immortals with the serial numbers filed off. However, the plot is weak. The resolution feels hasty. The story is not as good as the art that tells it. I greatly enjoy Warren Ellis' genre smashing one-offs, and the art here is fantastic as well. In Aetheric Mechanics we're presented with a Holmes pastiche set in an Edwardian Steam-punk world, but by the end of the story the whole world has been re-written. Clever stuff, and the details are marvelous, I particularly enjoyed the reference to Lesser Fenwick. It's such a short, sharp little piece that to reveal much more would be to reveal too much. The illustration is great, but this is one of those science fiction stories where people talk a lot and there's one central idea. It's a cool central idea, but this story would've worked better for me as prose (or a STAR TREK: THE NEXT GENERATION episode). I just don't read comics to look at pictures of people talking.